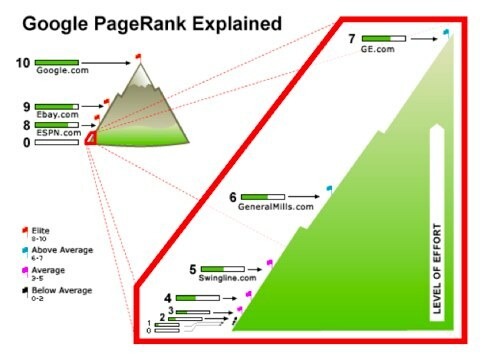 Does Google PageRank Really Matter? So, the question is, does Google PageRank really matter? Should you focus on increasing your PageRank? Should you panic if your PageRank changes? These are all great questions when you’re deciding on what’s most important to focus your energy on when optimizing your website. By understanding what PageRank is and how it’s calculated, you can see its limitations in a changing search landscape and see what it can be used to measure. PageRank, named after Google co-founder Larry Page, is a technology that assigns a value to ‘the importance of a webpage by looking at other pages that link to it, in addition to other data. In other words, Google assigns a score to every page it indexes based on the quality of the websites linking to it. PageRank is scored on a 0-10 basis, with a PR0 being the lowest and PR10 the highest. New websites will have a PR of N/A until Google updates it. This formula is the original equation published when Google first came out the the PageRank metric, and although it has most likely gone through much change and many iterations over the years, the basic values are probably still quite similar. In this equation, ‘t1-tn’ are pages linking to A, and C is the number of outbound links that a page has. D is a ‘damping factor’ which is usually set to 0.85. The most important conclusion you should draw from this is that links coming from a PR3 page with 5 outbound links would be more valuable than links coming from a PR5 page with 1,000 outbound links. logarhythmic scale. This means the difference between a PR0 rank and a PR1 rank is not the same as the difference between a PR7 and a PR8 site. How often does Google update PageRank? Historically Google updates PageRank a few times a year in the toolbar; however it’s actually updated constantly on Google’s end. There were 5 updates in 2008 and 5 in 2009; 1 in 2010, and 3 in 2011. Google doesn’t show us the new PR scores to prevent people from focusing on it; they’d rather see webmasters create great content and value rather than focus on PR all the time. The fact is, just because a site has high PageRank doesn’t mean it will necessarily rank high in search results. Also, a lower PageRank doesn’t mean your site won’t rank well. We have seen many instances where a page has lower PageRank than other pages but still outranks them in SERP’s. In an SEOmoz study, over 4,000 keyword phrases that appeared in the SERP’s were correlated to their PageRank scores. 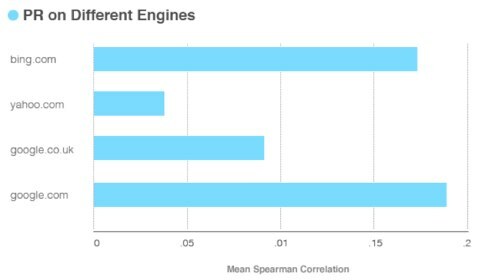 A perfect correlation would mean that there would be a 1:1 relationship to PageRank and SERP rank. The result of the study was that PageRank only correlated to a level of 0.20; far less than you would expect if PageRank was the critical factor in where your page shows up in search results. So in reality, PageRank only slightly correlates with actual rank (see below). PageRank clearly isn’t as important as it used to be, and as Google explains, it’s only one of over 200 factors that goes into its algorithm for ranking web pages.